For the English footballer, see Billy Garraty. William E. "Bill" Garity (April 2, 1899 – September 16, 1971) was an American inventor and technician who attended the Pratt Institute before going to work for Lee De Forest around 1921. Garity worked with DeForest on the Phonofilm sound-on-film system until 1927, when Pat Powers hired Garity to develop a sound system that Powers called Powers Cinephone. 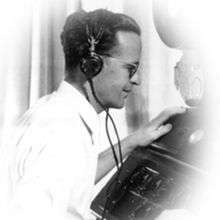 Garity is best known for the his employment at Walt Disney Studios, which used the Cinephone system in the late 20's and early 30's. In 1937, also at the Disney Studios, Garity developed the multiplane camera. Ub Iwerks, having left Disney to work at his own studio, developed an unrelated multiplane camera, during this same time period. In 1940, Garity developed Fantasound, an early stereophonic surround sound system for Disney's Fantasia. After leaving the Disney studio, Garity later became vice president and production manager for Walter Lantz Productions. He was inducted in the Disney Legends program in 1999. ↑ Parkinson, David (2007). The Rough Guide to Film Musicals. Penguin. p. 161. ↑ LoBrutto, Vincent (2005). Becoming film literate: the art and craft of motion pictures. ABC-CLIO. p. 138. ↑ Garity, William E.; Jones, Watson (July 1942). "Experiences in Road-Showing Walt Disney's Fantasia". Journal of the Society of Motion Picture Engineers. United States. 39.